New data shows collaborating with Indigenous peoples can improve results in conservation research. A new study has measured the scientific contribution that Indigenous peoples bring to a research project, beyond the moral or ethical value. “Traditional owners often don’t have a voice in science. This is a case study for Indigenous groups globally to hold up and say; ‘We deserve a voice’ and ‘We deserve input into research’,” says Dr Georgia Ward-Fear, a conservation biologist and herpetologist (amphibians and reptiles) at Sydney University. Dr Ward-Fear has been working in WA’s remote Kimberley region protecting large goannas from the devastating impacts of invasive, poisonous cane toads. Over 18 months, teams made up of a Western scientist and an Indigenous ranger would set out at daybreak to find and capture the goannas – which can grow up to 1.7 metres in length and weigh more than six kilograms. They fitted the lizards with radio transmitters and then released them and trained them to avoid eating the large toads. They did this by approaching the animal in the field, and feeding the goanna a small toad, large enough to make them sick but not kill them. This put the lizards off eating the toads once the invasion arrived. The aversion training has been hugely successful and is now being rolled out on a large scale via the Cane Toad Coalition, a consortium of scientists, government authorities, conservation groups and the Australian Research Council. But Dr Ward-Fear said the success of the initial project would not have been possible without the input of the Balanggarra Rangers, who are traditional owners of the land. “Working with Indigenous rangers, you get to see their unique skillsets. Once we showed that the trial worked, I was curious to see whether this contributed to the success of the study in a way we could quantify,” Dr Ward-Fear said. “Even though we worked in teams and had the same opportunity to spot the lizards, there were significant differences in the animals that the rangers spotted,” she said. 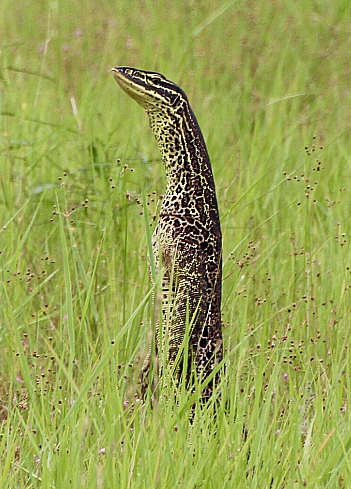 Published in Conservation Letters, the study found the Indigenous rangers were able to find and collect a subset of large varanid lizards (goannas) that Western scientists were unable to spot. Importantly, these lizards displayed different behavioural profiles throughout the study: they were more ‘shy’ than the bolder lizards foraging in broad daylight; and they also learned the aversion technique better than the braver lizards. “These ranger-spotted animals responded better to the conservation technique and they actually drove the significant result of the study,” Dr Ward-Fear said. James ‘Birdy’ Birch is the head ranger with the Balanggarra Rangers. He expanded on the unique skills of the rangers. “We had access to country for a start,” Mr Birch said. “We knew where the goannas were and we caught over 100 of them. We just had a keen eye. We could see them miles away. Mr Birch believes science can benefit from combining the two “ways of looking”. “You’ve got the Western way of looking with all the tools and the data, and you’ve got the Indigenous way of looking at things. Together, Western science and Indigenous knowledge, they complement each other,” he said.